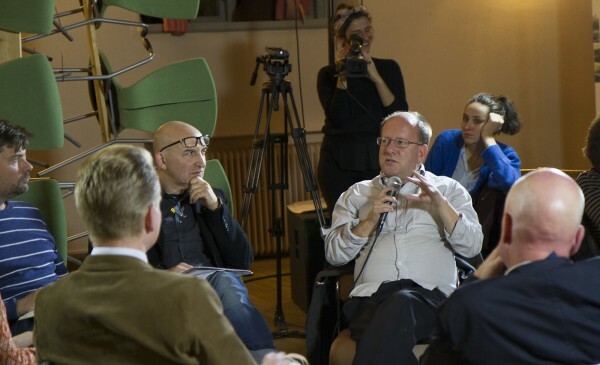 A televised conversation with Ana Betancourt, Björn Ehrlund, Tor Lindstrand, Henrik Nerlund and Sven-Olov Wallenstein, moderated by Peter Lang and STEALTH.unlimited TALK SHOW: normalcy is a contribution to the The Normalcy Project, a cluster of related art events, public presentations and academic courses organized by Kungl. Konsthögskolan | Royal Institute of Art in Stockholm between September 2013 and April 2014. Donatella Bernardi Program Director TALK SHOW: normalcy will explore issues like: Can architecture be detached from its original mission? Should we destroy the old to make room for the new? Can society afford to lose symbolic memories? These questions are posed in the light of Beckomberga being a symbolic institution in transition and in the light of The Normalcy Project as a way of re-setting that memory. The talk show will further go into the notion of architecture as an inscriptor of normalcy in society and draw parallels to the ongoing restoration and repurposing of abandoned historical monuments into luxury housing projects common in Stockholm today. PARTICIPANTS Ana Betancourt is an artist, architect and a professor in Urban Design at the School of Architecture, Chalmers University of Technology (Gothenburg). She explores issues of ecology, critical design, cultural agencies and art activism. Her work investigates alternative strategies and ways to operate and catalyze change within global transformations affecting cities today. Björn Ehrlund has since 2010 been a project manager at Riksbyggen, a large co-operative association providing services and expertise in housing, currently working on the adaption of Beckomberga. Ehrlund has a long career in the construction business since the 1970s, and an Engineering degree from Stockholm’s Technical Institute, 1989. He has been involved as a supervisor and manager in various residential projects in Stockholm and Germany. Tor Lindstrand is an assistant professor at the Royal Institute of Technology (Stockholm) and a co-owner of the office of Larsson, Lindstrand and Palme. He has been working on projects oscillating between architecture, visual art and performance in numerous cultural contexts. Tor has been engaged by Botkyrka Konsthall to develop strategies for a new kind of art institution in Fittja, a 1970s neighborhood in the outskirts of Stockholm. Henrik Nerlund is an architectural historian. His main field is how urban renewal effects post-war suburbs. In 2012 he published ‘Spökmackar – en resa i estetik, arkitektur, rost, förstörelse, förfall och nostalgi’ (Ghost stations – a journey in aesthetics, architecture, rust, destruction, decay and nostalgia), about forgotten modernist architecture of abandoned rural gas stations in Sweden. Sven-Olov Wallenstein is Professor of Philosophy at Södertörn University (Stockholm) and editor-in-chief of Site. He translates works by numerous theoreticians and philosophers and is also an author of books on philosophy, contemporary art and architecture. His latest book ‘Architecture, Critique, Ideology: Essays on Architecture and Theory, and Heidegger, språket och poesin’ (ed. with Ola Nilsson) will come out in 2013. MODERATORS Peter Lang is Professor in Architecture History and Theory at the Royal Institute of Art, Department of Architecture, Stockholm (Kungl. Konsthögskolan, Mejan Arc). Ana Dzokic and Marc Neelen act with their practice STEALTH.unlimited between the fields of urban research, spatial interventions, curating and cultural activism. Among their activities, they conduct research at the Royal Institute of Art (Kungl. Konsthögskolan) in Stockholm.